The ability to run Citrix workloads in a public cloud is not new. The 7.x versions already provided terminal servers and virtual desktops in the cloud. However, all administrative activities and monitoring had to be handled in the cloud, and Infrastructure as a Service (IaaS) usually was still relatively expensive. Now that costs have fallen to significantly lower levels and the provider handles the administrative tasks, a detailed look at the Citrix Cloud is worthwhile. XenDesktop Essentials and XenApp Essentials (collectively, Citrix Essentials hereafter) manage and deliver Windows 10 virtual desktops and deliver Windows applications and shared hosted desktops from Microsoft Azure to users on any device. The applications appear to run locally on the user's computer. The XenApp and XenDesktop Service, on the other hand, provides applications and desktops independent of a device's operating system and interface, with IT control of virtual machines, applications, and security. Citrix Essentials differs from all previous cloud solutions in that it provides and operates the complete infrastructure, the delivery controller (including the required SQL Server database instance), Citrix StoreFront as the access point, and NetScaler Service. All services are, of course, fail-safe. 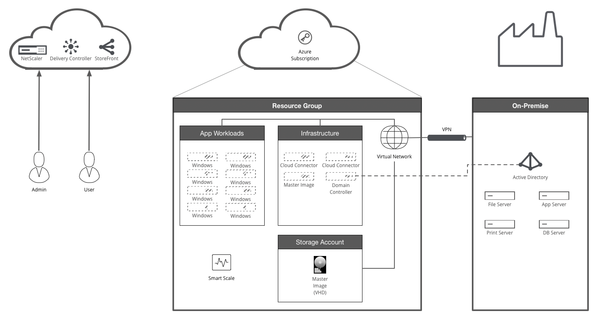 Complete provisioning of the components is automated through the Citrix Cloud. The provider also installs updates for both Windows and Citrix, which is a prerequisite for operation, because the customer has no administrative access to these components. If you compare the main differences between Citrix Essentials and the respective on-premises versions, you quickly realize that the range of functions is very limited. However, this is not necessarily a disadvantage, because often a reduced range of functions is completely sufficient for a specific purpose. To define the purpose, it is crucial to know that XenApp Essentials only provides published applications, whereas the on-premises installation supports published desktops, as well. XenDesktop Essentials exclusively supports virtual desktops with Windows 10. The on-premises installation of XenDesktop also supports Windows 7.8 and 8.1, as well as virtual desktops with Linux as the operating system. Essentials services are sold exclusively through the Azure Marketplace on a monthly basis and can only be ordered with a valid Azure subscription. Table 1 is an overview of the functional differences. To operate Citrix Essentials, you first need an account at Citrix . Please note that no other Citrix Essentials product can have previously been active in this account. If you want to run XenApp Essentials, XenDesktop Essentials, or XenApp/XenDesktop Services together, you need your own Citrix Cloud account. However, apart from the administrative overhead, this is not a problem. That said, if users continue to access desktops and applications through the various URLs, this can cause some confusion. If the Citrix Cloud account exists, the second step is an Azure subscription; this process is quick, too, just make sure you use the Pay-As-You-Go subscription only for XenApp Essentials, which cannot be ordered from Azure Marketplace without an Enterprise Agreement. If you already have an existing subscription for Azure, you can also use it for Citrix Essentials. In the Azure Marketplace, you search for Xen and both XenApp Essentials and XenDesktop Essentials are displayed. With one click you can order and set up the desired product. Please note, however, that both products are only offered in packages of 25 users, and you cannot transfer or use existing Citrix licenses. XenApp Essentials and XenDesktop Essentials each cost $12 per user per month. However, these are only the costs for the administration of the Citrix infrastructure, the corresponding license costs, and the operating costs of the infrastructure. In addition to these costs are the consumption costs for the terminal servers or virtual desktop instances, which are also operated on the Azure platform. By comparison, the user license for XenDesktop Enterprise is $430 plus $105 per year for the Citrix Success Services (CSS) license. Here, too, the costs for hardware, operating system, and operating and management costs are added. Citrix provides a very good cost calculator  to help you compare costs for a business case. Citrix provides all necessary infrastructure components in a completely transparent manner (Figure 1). All you need is a resource group that contains your components and the corresponding virtual desktops or terminal servers. When you order Citrix Essentials from Azure Marketplace, you need to create this resource group or select an existing one. Figure 1: Overview of the Citrix Essentials infrastructure (from the Citrix product documentation ). Depending on where you run your virtual workloads, you need to be aware of the Azure location in which you create this resource group (e.g., West/East/North/Central US, West/North Europe, Canada Central/East, Australia East/Southeast, etc.). You then need to link the appropriate Citrix Cloud account so that the resource group can also communicate with the management layer in the Citrix Cloud. Once this step has been completed and the service has been purchased by clicking Create , you can proceed with further configuration. Within Azure Resource Manager (ARM), first create a virtual network in the previously chosen resource group so that you can support network communication within the resource group. The virtual network needs a name, an IP address range, a location that should match that of the resource group, and, of course, a subnet with an IP address range within the selected virtual network. All virtual servers that you create later will receive an IP address from this subnet via DHCP. Since Microsoft announced the discontinuation of its Threat Management Gateway (TMG) – successor to the Internet Security and Acceleration (ISA) Server – companies have been looking for an adequate replacement. Citrix jumps into the breach with its various NetScaler products.